Steve Rice (Olympia, United States) on 5 February 2018 in Animal & Insect. Shortly after beginning our walk, we saw people looking up into a tree. This character was sitting there quite peacefully. 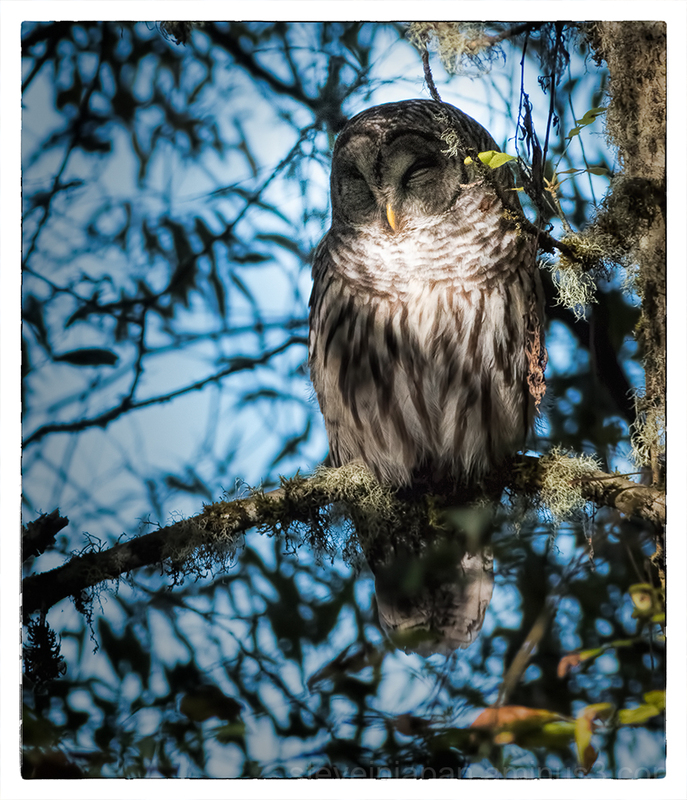 This is a wonderful capture of a sleepy owl. Splendide ! Très belle rencontre. Très chouette ! Belle prise. Wonderful capture ! an excellent animal portrait ! details, light, dof and bokeh, all is perfect ! A very fine study . . not often I get to see an owl. Great capture ! Excellent details ! Une très belle photo !!! J'aime beaucoup ! Excellent! Great capture, light and details! Awesome capture of this owl with with great detail!! I love the soft dapple light on him. Wonderful portrait in beautiful details. It looks so lovely. A very beautiful catch ! Great animal's portait ! Well done ! A beautiful image of this handsome owl. The light is superb and that light blue sky really makes the owl stand out nicely. May be he was fast asleep..oblivious to everything around ! He looks asleep, but I bet he was keeping an eye on what was going on. Usually owl pictures so big staring eyes, but this one is unusual and very good to show an owl peacefully sleeping it appears. Very well done. Wow !! spectacular.. I like a lot. I really like a lot. Mervielleuse iamge de cette chouette quelle compo superbe. Wow ! Marvellous shot and light and détails !!! Absolutely beautiful. Gorgeous light and color. He seems not to be bothered by his admirers below. A great image! What a find... fantastic! What beautiful detail you captured. did you happen upon it or know it slept there ? @sherri: I knew that owls sometimes visit the sanctuary. I knew nothing of this particular bird though. I adore this! Wow. The colors and the silence and the softness and light. Superb. What a magnificent shot ! Bravo Steve ! Congratulations on the Spotlight Steve! Very well deserved! Congratulations on your spotlight for this wonderful photo! @Mireille T.: Thanks so much. Congratulations on the Color Spotlight, Steve. . . and Congratulations on a well-deserved Spotlight ! Beautiful! ;-) I Love Owls!! That is wonderful. Great light. Congratulations on the Spotlight! @Ana Lúcia: Thank you, Ana. @Captain Guildive Ajoupa: Thank you.